Build a bigger, stronger back with this Ultimate Back Workout for Mass & Strength. A well-developed, V-shaped back shows strength and athleticism and is also critical for maintaining correct posture, muscular balance, and a strong core. However, building a big, strong back takes more than just a few pull-ups done from time to time. Back Mass comes from consistency and consistency equals muscle mass results. This Back Workout for Mass and Strength designed by expert trainer Les Hooper will deliver if you follow it consistently and progressively increase your loads. There is no quick fix for building your back muscles and no holy grail of back programs. Get in the gym, do the work, eat a macronutrient sufficient diet, and allow for proper recovery, and you will see positive changes in your body. In this ultimate back workout for mass Les has chosen functional compound movements that have the biggest bang for buck and still have a functionality that translates to real world back building results. Deadlifts are one of the best exercises to increase posterior chain strength, which a lot of people lack especially in the lumbar back. Proper technique is crucial though so make sure you have that nailed before upping the load. 1. Stand in front of a loaded barbell. 2. While keeping the back as straight as possible, bend your knees, bend forward and grasp the bar using a medium (shoulder width) overhand grip. This will be the starting position of the exercise. Tip: If it is difficult to hold on to the bar with this grip, alternate your grip or use wrist straps. 3. While holding the bar, start the lift by pushing with your legs while simultaneously getting your torso to the upright position as you breathe out. In the upright position, stick your chest out and contract the back by bringing the shoulder blades back. 4. Go back to the starting position by bending at the knees while simultaneously leaning the torso forward at the waist while keeping the back straight. When the weights on the bar touch the floor you are back at the starting position and ready to perform another repetition. 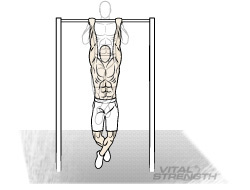 Weighted chin ups – This is another great back exercise especially to get that v shape on the Lats. If you can’t do 10 without weight then stick to bodyweight. On the last set take the weight off and do max reps.
1. Attach a weight to a dip belt and secure it around your waist. Grab the pull-up bar with the palms of your hands facing forward. For a medium grip, your hands should be spaced at shoulder width. Both arms should be extended in front of you holding the bar at the chosen grip. 2. You will want to bring your torso back about 30 degrees while creating a curvature in your lower back and sticking your chest out. This will be your starting position. 3. Now, exhale and pull your torso up until your head is above your hands. Concentrate on squeezing your shoulder blades back and down as you reach the top contracted position. 4. After a brief moment at the top contracted position, inhale and slowly lower your torso back to the starting position with your arms extended and your lats fully stretched. Bent over row – A great rowing exercise to add heavy loads to. Ensure you keep your elbows close to the torso and pull towards the hip to hit the lats and lower trapezius the most. Again, on the last set lower the weight 30% and do max reps.
1. Holding a barbell with a pronated grip (palms facing down), bend your knees slightly and bring your torso forward, by bending at the waist, while keeping the back straight until it is almost parallel to the floor. Tip: Make sure that you keep the head up. The barbell should hang directly in front of you as your arms hang perpendicular to the floor and your torso. This is your starting position. 2. Now, while keeping the torso stationary, breathe out and lift the barbell to you. Keep the elbows close to the body and only use the forearms to hold the weight. At the top contracted position, squeeze the back muscles and hold for a brief pause. 3. 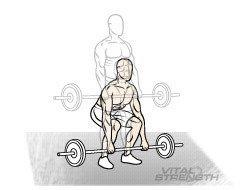 Then inhale and slowly lower the barbell back to the starting position. One arm rows – Another great rowing exercise for Lower traps, Rhomboids, Lats and also acts as a core stabilisation exercise through anti-rotation and anti flexion of the torso. Last set is max reps 30% less again. 2. Place the right leg on top of the end of the bench, bend your torso forward from the waist until your upper body is parallel to the floor, and place your right hand on the other end of the bench for support. 3. Use the left hand to pick up the dumbbell on the floor and hold the weight while keeping your lower back straight. The palm of the hand should be facing your torso. This will be your starting position. 4. Pull the resistance straight up to the side of your chest, keeping your upper arm close to your side and keeping the torso stationary. Breathe out as you perform this step. After your back workout we recommend consuming a high protein shake, like Vitalstrength Pro-Muscle to help build muscle size and feed your muscles. Pro-Muscle is a genuine high protein mass gainer that is packed with superior quality whey protein isolates, delivering muscle growth nutrients when you need them most. Both Nutrition and Supplementation are paramount to any training routine. Without proper Nutrition i.e. the appropriate balance of protein, fats and carbs you will never maximise your muscle gains. The supplements you choose are a personal preference, however it is important to ensure your body has the fuel it requires to perform at a level which delivers muscle building results. Make sure all supplements are of high quality and support your training goals.